Some women are asked to go to an assessment clinic for further tests following their initial breast screening mammogram (X-ray). Some breast tissue may be taken at the assessment clinic appointment but the results can sometimes be inconclusive. In these cases, women may be offered a vacuum-assisted excision (VAE). This involves breast tissue being removed by a needle attached to a vacuum device. The tissue can then be analysed in a laboratory. This procedure aims to give women a definitive diagnosis without women having to have surgery for a condition which may not be cancer. 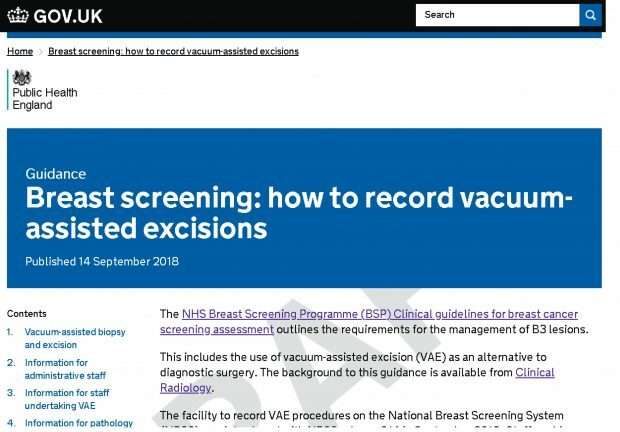 NHS Breast Screening Programme assessment guidelines published in 2016 advised services when to use VAE to help women obtain a diagnosis of cancer or exclude the possibility of malignancy. We updated the national breast screening computer system (NBSS) in September 2018 so that it is now possible for screening services to enter VAE information in a standard format. We have now published guidance for recording VAEs, aimed at screening office staff, pathologists and healthcare staff who carry out the procedures. This will help us monitor consistently the use of VAE and make sure breast screening services are following national guidance. Breast screening services should enter information in the new format on NBSS for all women having VAE procedures on or after 1 April 2018.